The SGR-24 is designed for smaller gatherings with portability in mind, while offering all the features of the Silver Giant commercial gas grills. Two stainless steel side shelves and other options round out the complete package. 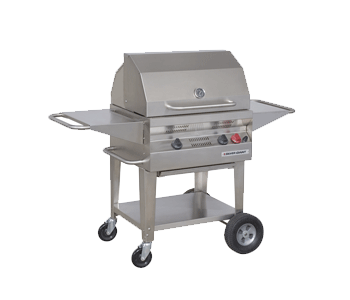 The Silver Giant SGR-24 was designed with the backyard barbecue enthusiast in mind. Ideal for family gatherings, the SGR-24 incorporates all of the premium features of the larger Silver Giant commercial gas grills, in a smaller residential model. Two stainless steel side shelves and smoke hood options round out the complete residential package.